If This Isn’t Genocide, What Is? To hear Europeans speak today, you’d think that nobody in the 1930s and 1940s supported the industrialised genocide that destroyed Europe’s Jewish population. And yet, history tells otherwise. Most people in France, Germany, the Netherlands, Poland, Italy and other European states simply ignored what was going on (if they weren’t actively complicit). Britain and other nations refused to allow in Jewish refugees. Most of those on the right, and many on the left, accepted at least part of the “Jewish Problem” justification. European Jews had no powerful friends. When the state of Israel was founded after WWII, Europe rushed to recognise and embrace it. Although it was created by terrorism and ethnic cleansing, Europeans turned a blind eye – partly out of guilt, and partly to maintain that anti-Semitism was someone else’s fault. “Me, anti-Semitic? But look, I support the state of Israel!” As millions of Arabs were forced from their homes, nobody said anything. But those who thought the Zionists would simply be content with driving out some Arabs, taking some land, weren’t paying attention. Israel’s founders were already patiently working to a plan: the annexation of all the land. Every war, every attack is an opportunity for retaliation. As we have seen repeatedly, a single terrorist attack – even one that claimed no lives – could be the excuse for a full-scale military onslaught, with troops, bombs and chemical weapons used against civilian targets. Although Israel repeatedly claims to be “defending itself against terrorism”, only the most blinkered could still believe that to be true. Every act of Israel’s has been to destroy peace treaties and encourage terrorism. When Yasser Arafat’s PLO was ready to do business, Israel aided the creation of Hamas, to make sure no deal could be done. In 2006, Hamas seemed ready to recognise the state of Israel – so the Zionists responded by attacking Hamas and strengthening anti-Israeli sentiment in Gaza. Israel is not looking for treaties or surrenders; the Zionist goal is, and has always been, a Jewish state on the entirety of Palestine (and quite possibly beyond). The map above illustrates a clear trend. Israel knows that its genocide cannot be carried out too quickly; it must be slow enough that the Americans (if nobody else) can be persuaded that it isn’t even taking place. Yesterday, I tweeted a link about yet another small part of this slow genocide. Israel is about to begin rounding up around 70,000 Bedouin Arabs, destroy 35 villages, and place these people into – effectively – concentration camps. I used the term Final Solution in the tweet – this term related to the annihilation of European Jews by the Nazis. My tweet received some hostile reaction (as tweets about the reality of Israel always do) – and not just from Zionists. It seems that the term – Final Solution – is now exclusively for Jewish use, and can only be applied to one specific genocide. But I picked the term very carefully. To deny use of the term means denying a deliberate genocide, with a planned end-game, is underway in Israel/Palestine. And without doubt, genocide is happening before our eyes. The Nazis talked of a “Jewish Problem”, and formulated a Final Solution to it: the Holocaust. Likewise, the Zionists see the existence of Arabs in Israel and the West Bank as their “Palestinian Problem”, and they too are working on a Final Solution. The round-up of the Bedouin mentioned above is just one of many small pieces of this genocide. Most of the genocide takes place in fragments so small that unless you pay attention, it could appear like a series of unlinked incidents. Use of chemical weapons against civilians. Cutting water supplies. Olive groves destroyed. 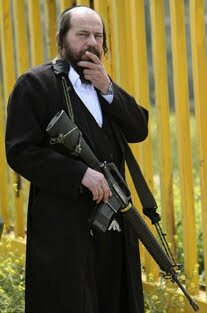 Zionist settlers allowed to shoot civilians, even children, while the IDF stand by and watch. Day in, day out, Palestinians are killed, injured, arrested, beaten, driven from their homes, see their homes demolished and many more humiliations, provocations and injustices. Many on the left are either afraid to be labelled anti-Semitic, or are genuinely blind to the scale of the Zionists’ ambitions. Being of Jewish background, I can laugh off accusations of anti-Semitism; I applaud the bravery of those non-Jewish supporters of Palestine who are called anti-Semites on a daily basis. The Zionists use every tool in their arsenal, and accusing opponents of racism is one of their favourites. I find it tragic that the mainstream left, which failed to see Europe’s approaching genocide in the 1930s, seems oblivious to an ongoing genocide. In case you’re still missing the big picture, you’ve ignored the past 60 years of evidence, and the map above doesn’t help either, let me put it in plain English: the Zionists have no intention of stopping until every last scrap of land in Israel and the West Bank is taken by Jews. But this leaves them with a “Palestinian problem” – despite already killing or expelling millions, there are still millions of Arabs left. From the Zionist perspective, this must be dealt with – and it will be. The Zionists have not stopped advancing, killing or grabbing land for one single day since the 1940s. How naive would you have to be to assume they intend to stop now? Simply grabbing most of the land isn’t enough for the Zionists to achieve their goal. Even within Israel, there is a growing Arab population. Left untouched, this will overtake the Jewish population in size at some stage. The Zionists are on a long-term mission; the creation of a permanent Jewish state requires a Final Solution: a permanent guarantee that Israel will remain Jewish. This inevitably means “cleansing” the land of non-Jews. Their logic leaves no space for any other interpretation. Besides the endless violence in the West Bank, and the brutal blockade of Gaza, the Final Solution must take place within Israel too. Recent mob attacks on African immigrants have been widely reported; but this is institutional, not just street violence. Non-Jews are harassed at the border, and refused medical treatment. Now Arabs within Israel itself are being rounded up by security police – how much more closely does Israel have to resemble Nazi Germany before the world takes action? Anyone who follows and understands the Zionist mindset will understand what is going on. The rise of fascist sentiment in the Israeli leadership, military and population is a prelude to what the Zionists believe must happen next; Israel has always committed atrocities since its birth, but now, much more blood must be spilt to finish the job. The West Bank cleansing is growing in speed; attacks on non-Jews in Israel are accelerating. And Israel beats the drum of war towards Iran and Lebanon too. It appears that some sort of deal has been struck between the US administration and Netanyahu – he went quiet after his meeting with Obama earlier this year, and is likely waiting for the US Presidential elections to be held in November. After that, whoever wins, expect to see Israel go on the warpath (with the US in support). It’s not fashionable to deny the Holocaust, but denying that Israel is committing genocide is perfectly normal. Politically correct, even. The European left bites its tongue, as it did in the 1930s. Many members of my extended family died in the Holocaust – I make no apology for comparing the Nazis with today’s Zionists; many Holocaust survivors have also done so. Again I feel frustration and shame as the cowardly left makes the same mistake it did in the 1930s – misunderstanding and underestimating the genocidal nature of fascism. The last Palestinian village in the West bank will look just like the Jews’ last stand in the Warsaw ghetto. And just as in Warsaw, most of the Western world will just look the other way. The fallout continues from the recent Toulouse shootings; at the time of writing, a French man of Algerian origin, Mohammed Merah, is under siege by police at his home. Regardless of the motivations behind the attacks, the outcome will be broadly predictable: a strengthening of the racist, moronic right in France and mainland Europe in general, and a win for Zionists. Why? Let’s look at France first. France, as I’ve reported, is probably the most racist country in Western Europe. Worryingly, this is no recent blip, but seems consistent throughout recent French history. While constitutionally, all citizens are equal, and France has consistently rejected a multicultural approach, in practice, black, Jewish and North African citizens have always found integration difficult, and tend to share the same ghettos. An attack by a North African, one of the most persecuted French groups, would quickly be linked to immigration, boosting the racist right’s claim that there “too many foreigners in France“. The far-right in France, represented by the National Front, is going through a brand detoxification under its new leader, Marine Le Pen. The National Front regularly polls in the 20% range; additionally a strong racist vote goes to Sarkozy’s right-of-centre UMP, as indicated by Sarkozy’s pandering to racism. Contrast to the UK, where the far-right struggles to gain 5% of the vote, and the strength of race hate in France becomes clear. Anecdotal stories from French friends, both white and brown, strengthen this picture. The French have recovered from any shame they may have felt over their enthusiastic implementation of Nazi anti-Jewish policies, and open racism is again prevalent in the French street. In summary, the French situation is simple: any race-related attack by anyone will serve to strengthen French fascists. But Israeli Zionists too will be heartened. The Israeli right has long focused on the anti-Semitism experienced by France’s large Jewish community. While broader Jewish interests would be served by the preservation of what remains of non-Israeli Jewish communities, the Zionist goal is clear: to maximise Israel’s Jewish population in order to strengthen and accelerate the ongoing theft of Palestinian land. To the Zionist right, the existence of half a million Jews in France is a waste of Jews. Indeed, rather than strengthen and support France’s Jewish community, Zionists (including late PM Ariel Sharon) have often been caught trying to frighten French Jews into migrating to Israel. As in the 1930s, France has become one of the European strongholds of the racist right. The coming election thus becomes a litmus test of French views: can the National Front increase its vote? Can it again make it through to the second round of voting? If it does, Sarkozy and his previously mainstream UMP will likely strengthen its immigrant-bashing rhetoric in order to shore up its share of the racist vote. France threatens to fall to fascism as it did once before.